(Phys.org)—A trio of researchers has found evidence that suggests wind erosion on river canyons may have more of an impact on the shape of such canyons than scientists have previously thought. In their paper published in the journal Nature Geoscience, Jonathan Perkins and Noah Finnegan with the University of California, and Shanaka de Silva with Oregon State University describe their study which compared river canyons in South America, some of which were subjected to wind, and some of which were shielded by mountains. Taylor Perron with MIT offers a News & Views piece on the work done by the team in the same journal issue. To better understand the impact wind erosion may have on the shape of river canyons, the research trio studied satellite images of sections of Chile—one where there were a lot of river canyons. They looked at two groups of river canyons, one where the canyons were exposed to wind and its impact, and the other where canyons were protected from wind by nearby mountains. Examination of the images revealed stark differences—those canyons that had been exposed to wind were longer and smoother and had on average grown ten times faster than those canyons shielded by mountains over their millions of years of history. Those canyons exposed to the wind, the team noted, looked like large gouges in the surface of the Earth, whereas those that were protected were stubby and softer looking. The team is not suggesting, as Perron points out, that some similar canyons may have come to exist due solely to wind erosion, rather that it appears that both wind and water contribute significantly to the shape of river canyons. The researchers note their findings could have implications beyond river canyons here on Earth, pointing out that similar canyons exist in other places, such as on Mars. Space scientists, they note, use canyon geography to try to estimate how much water may have been present in a given area during a given time period, but little consideration has been given to how much impact wind on the Red Planet may have contributed to the way the canyons look today. They suggest that wind conditions on and around Martian canyons be taken into consideration before attempting to make water impact estimates. Bedrock canyons are ubiquitous on Earth and Mars, and river canyon morphology is commonly used to interpret the climatic and tectonic histories of landscapes. On both planets, however, many bedrock canyons exist in dry, wind-dominated environments. Although wind abrasion can significantly influence the evolution of arid landscapes, the role of wind in shaping arid bedrock canyon systems is poorly understood and thus typically neglected. Here we exploit a natural experiment on the western slope of the central Andes that allows direct comparison of wind-affected and wind-protected canyons. Through a combined analysis of the morphology of 36 canyons and topographic wind simulations, we show that wind abrasion can amplify bedrock canyon incision rates by an order of magnitude above fluvial rates. Our results imply that wind can extend bedrock canyons—landforms traditionally thought to evolve only from flowing water. Furthermore, our analyses reveal a direct relationship between aerodynamics and landscape evolution on varying scales. Topographic shielding of high winds by mountains modulates the pace of canyon retreat, while individual canyon profiles become aerodynamically streamlined. 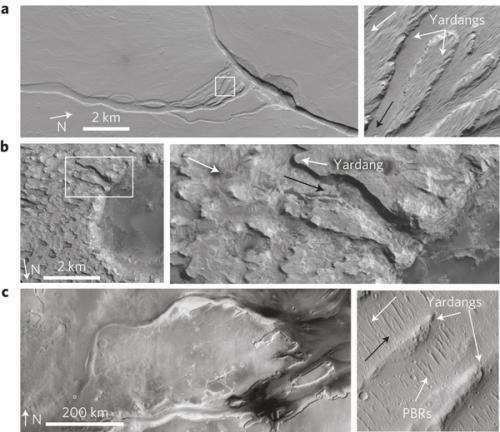 We conclude that wind abrasion can significantly modify the morphology of bedrock canyons and suggest that wind may have similarly reshaped fluvial landscapes on the martian surface.